Blog - Page 2 of 2 - Adam's Rib Co.
Today we were afforded the opportunity to snap some photos with the great men and women of ShandsCair. We served up Gainesville’s best BBQ for all of the hardworking individuals that make the critical care unit at Shands possible. Adam’s Rib Co. has officially invaded the other end of 13th street. What once used to be a great place to grab a sandwich, throw down a drink and watch a game, is being transformed into a new addition to the Rib Co brand. The progress from the very first day after closing, which is below, right down to the grand opening will be available exclusively on Adam’s Rib Co and McFall Builders. McFall Builders was chosen for the renovations of the old Joe’s Deli for their superior construction methods, integrity and over thirty years of experience in Gainesville. Below you will find a few pictures from the first day after signing. The new space will accommodate nearly double the occupants that the NW 13th st. location does. To find out more about the ongoing project check back weekly. There will be ongoing updates on both the Ribco website as well as the McFall website. Gainesville Catering for your next event by Adam’s Rib Co.
Gainesville catering is something we have come to be known for. There is nothing better than knowing the cooking is taken care of and Gainesville Florida’s best ribs are on the way. We specialize in catering office parties, corporate luncheons, church dinners, and the list goes on. Adam’s Rib Co. is the premier Gainesville catering company offering a full menu when you need it. Have our staff deliver and setup the best ribs in Florida for your next event. Maybe you would prefer whole smoked chicken, chopped pork, or beef brisket. Sometimes Adam says it’s best to just get some of em all. Our selection of sides will ensure everyone has something they like. We suggest you come back and try them all because we know you will love them. We are one of the few catering companies in Gainesville dedicated to bringing you BBQ. Make your next event one that everyone will remember by choosing Adams’ Rib Co.
To have Adam’s show up at your Gainesville Catering event fill out the online form here. Below you will find an excerpt from the Alligator newspaper. Our restaurant and owner were featured recently and the article in its entirety can be viewed by following the link below. Adam Brewer is the Owner/Operator. Gainesville’s best ribs are the foundation for success at Adam’s Rib Co. If you can’t tell from the name, we take our ribs seriously. Our slogan is Puttin’ The Rib Back in BBQ and we feel that this is an area that most BBQ restaurants have put on the back of the pit. While there are many different hypothesis in the industry as to why this may be such as price, toughness and sloppiness. It is true that rib meat pound for pound is less than a chopped, pulled, or sliced pork, chicken or beef, it is no excuse to neglect what is widely considered to be the best meat on the animal. All of our ribs are slowed cooked to perfection over some of the best seasoned wood that I inspect for quality each time. Everyone knows that cooking ribs over a slow low heat is the best method to maintain all of the juices, and natural flavor. When the meat gets cooked low and slow it slowly breaks down the connective tissue that normally causes rib meat to be tough. We pull our ribs out at their peak timing when all of the connective tissue is broken down but prior to the juices beginning to dry up. The choice wood that gets used for the bed of coals is what adds that distinctive flavor of Gainesville Florida’s best ribs. This is why we decided it was our duty to put the Rib Back in BBQ. Mike over at Gatorglob notified us about the writeup on their website Gatorglob.com. This is a great website to be used for local eats. With targeted local information about places to eat it makes it a must have for the bookmark column. Here is an excerpt from the review By Mike Sanford, GLOB Editor. Adam’s Rib Co. on NW 13th St. could become one of Gainesville?s lunch time favorite ‘Que joints for folks serious about a healthy serving of their favorite protein cooked over open flame. Everything at Adam’s is so flavorful and rich. It may make you feel a little fat afterward, but the feeling is absolutely worth it!! My favorite sides have been the seasoned fries and the mac and cheese! The pulled pork sandwich is amazing and I would recommend any of the bbq sauces! Adams Rib Co has yet to disappoint. The meat is always tender and juicy and the sides always taste amazing. Below is an excerpt from the writeup we received in Gainesville Today. The full article may be viewed at the Gainesville Today website. 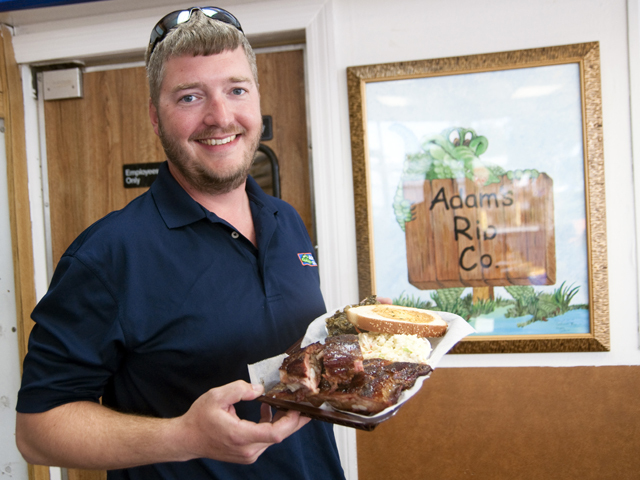 Adams Rib Co. offers the best selections of bbq ribs, chicken, pork, beef and turkey in Gainesville Florida. Make sure to bring your appetite when you come in to eat at Adam’s Rib Co. We fuel our rotisserie smokers with a variety of wood like pecan, hickory and red oak that impart the meat with our signature flavors. We offer a wide variety of original sauces from honey sweet to habanera hot and everything in between. We use fresh meat that is locally raised, the finest local produce, and we offer fabulous desserts. Dine in or take out. Let us cater your next event or tail gating party.